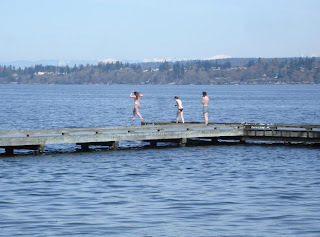 These hardy souls disrobed, giggled, then jumped one by one into Lake Washington. The high temperature today was 62°F (16.7°C). The lake temperature in April is usually around 46°F (8°C), as per King County data. There were actually six of them; three are already in the water. I'm impressed!